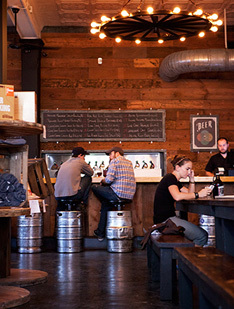 Craft and Growler is part bar, part retail space. One wall is shelves filled with empty growlers, which are large, reusable bottles for taking home draft beer. You can’t do this at just any bar, and, in fact, there are only a handful of places in Dallas to fill up. But Craft and Growler is an actual bar, too. Taps hang over a metal trough behind a bar that’s clean and shiny. Beer from thirty taps is offered and dispensed with long tap handles that look like some stainless steel medical device married with a magic wand. Two taps are reserved for North Texas breweries at all times. The space is industrial-cool, big, airy, with concrete floors and long tables. The windows are nearly floor to ceiling, revealing big skies and Fair Park across the street. The whole place feels as much like an artist’s loft as it does a wine cellar, with some German beer garden thrown in. If you get hungry, food from neighboring Meridian Room is served.